I'm sorry to hear you're having trouble with your connection. I've located your account and I can see you've spoken to a member of our team since posting. Let us know if you need anything else. Vivid 300/350 has no STM on DL or UL but ALL Tiers do have P2P Traffic Shaping at peak times if needed in certain areas. Still unresolved and I'm paying for Vivid 200 with speeds I'd expect from a 30Mbs connection. Really sorry to hear of this. What was the resolution to the last call/chat about the package? 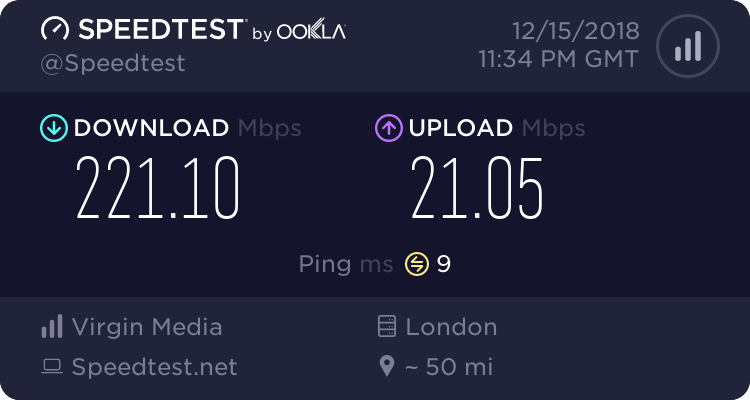 Regarding the speeds, is this a wired/wireless test please? The last call a technician asked me to do some goto test like resetting the hub to the point where it made things worse as it stopped my sound system working, so I had to reset the whole thing and set it up again. He then said there is a fault on my hub and then said he'd put me through to someone who could help me with my problem and put me back on my original package. After about 10 minutes on hold I was then put through to Ashley King in complaints department. All she did was interrupt me and was extremely rude to me. She offered me vivid 350 to get the upload speeds I wanted but the speeds are not guaranteed and can only guarantee on the download speed. I agreed to then and was told I can't have it as it's not available in my area. At this point I had enough because she had no intention of putting me back to my original package and was offering my packages that I I couldn't even get. What was the resolution to that last call/chat with us? My last post was the last call I had with Virgin, nothing has been done since to resolve the issue. Every time I have tried to call I don't get put through to anyone who will listen or can actually help, which is why I came to the forum to so if there is a resolution or if anyone has any similar situation. Very sorry to hear you haven't got this resolved. Unfortunately, the gamer package is no longer available so we wouldn't be able to change you back. However, the speeds you are getting shouldn't be affected to that extent as you are still on 200mb package. What diagnostics have you gone through with the team when you have mentioned this to them?